With approximately 30,000 square feet under roof, we have the capacity to service over 60 vehicles under repair at any time. With this type of room and volume, we are the largest collision center in Longview and surrounding East Texas area. While we consider ourselves a production facility, we are still able to maintain a high level of quality control with our experienced technicians, state of the art tools and equipment. Our collision shops are equipped with three Car-O-Liner unibody alignment machines and one Chief frame machine which allows us to handle multiple extensive repairs at one time. To help produce a factory type spot weld, we have added the Car-O-Liner spot welder. This gives us the ability to replace welded panels, yet making the finished product look as close to a factory welded panel as possible. This makes it less noticeable your vehicle has been involved in a collision. 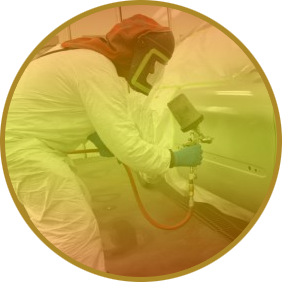 To help produce a factory type finish, we utilize two Spraybake and 1 Blowtherm heated, forced air paint booths. These heated, filtered booths help us to paint in a controlled environment helping to produce a cleaner final product in a shorter amount of time. Another advantage of using McDaniel's is our ability to do our own 4 wheel alignments in house with our John Bean alignment system. This helps us to verify any structural or suspension repairs without making multiple trips to an outside alignment shop. As you will see, we have all of the major equipment along with a vehicle lift and air conditioning machines that allows us to keep most repairs in house.